First warbler sighting today. 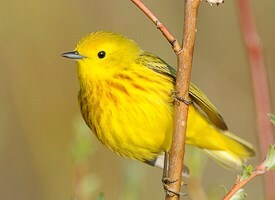 It's a beauteous Yellow Warbler (left photo). Nice and plump, right outside the window. Some years you will see dozens of different colored warblers flitting around at various levels of a tree like animated Christmas decorations. The wonderful pair of Manolo Mendez and Debranne Patillo have created a series of incredible photos showing the horse's skeleton, muscles, tendons, etc. Not sure why, but ice out on Tarbert Lake nearly always brings us a visit from the Otter Clan. Known for their love of fun and healing, otters are very talkative. My sister, cousin Susu and I got yelled at one September day in the Boundary Waters Canoe Area by four otters as we sunned ourselves on what turned out to be THEIR ROCK. This time of year, our otters love to swim in the slush along the edge of the ice, occasionally popping up for a roll on the frosty crystals. This year’s visitors seem well fed, nice and plump right down to the tail. Yesterday I watched one through the birding scope eating a nice fish up on the ice and then sliding back into the watery slush. I took this video a few years ago from our living room window. Even though I married a bear, I love the Otter Clan. Have you been to Northern Lakes Farm? If so, there is a very good chance you’ve met Mr. (and maybe Mrs.) God Bless America. Just about every morning - spring, summer and fall - God Bless (as we call him) flies across the paddock right over our heads and lands on one of the 50-foot Norway spruce trees. This is one of the highest points in western Laketown township. It provides great view for fishing and hunting. He shows up in the winter too but not as often. Many mornings he talks with me about the things he has seen flying over our shared landscape. Gabby. That is what I’d call him. Very gabby. There are also many days when Mrs. God Bless joins him. And, some days he brings along his immature eagle son - who, by the way is really growing up now and sometimes comes over by himself. I wish I had a better picture of the pair up in the tress but my camera doesn’t have the big lens. One of our most beloved clients – Susan – had her son, who lives in California, take pictures with his Hollywood camera but we haven’t seen those yet. This shot is the best proof we have for now. I keep meaning to make a list of my favorite horse books. And I will. In the mean time, I will simply recommend what may well be The Best Horse book Ever. 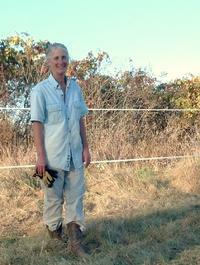 Many people know Dr. Deb Bennett from her articles in Eclectic Horseman and Equus on biomechanics. They are excellent. There are countless photos, drawings and graphs. You could just skip the text and still have a wonderful winter’s worth of reading. In order to explain the history of horsemanship in the New World, Bennett takes you back thousands of years into the Old World. As a cultural history, you learn about the empires, migrations and fashions that molded horses. Most rewarding for Gaited Horsemanship enthusiasts such as me, Bennett weaves the history of gaited horses throughout the story. 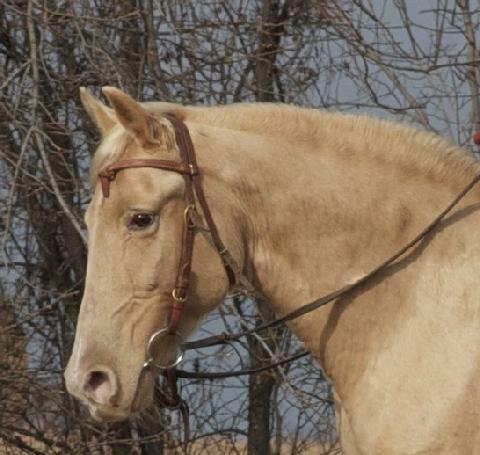 Ever wonder why there are almost no gaited horses in Europe? That’s a whole other entry. Click here to learn more about Deb Bennett. Ph. D.
Like many livestock people, we are dealing with forage shortages. Drought and high commodity prices combined in 2012 to put a squeeze on our favorite modes of nutrition – grazing in the summer and small grassy bales in the winter. We usually do just fine with frequent pasture rotation in the summer. For the winter, we make our own small bales and buy them from long time suppliers. However, last fall the drought cut our pasture time short and the supply of small grassy bales petered out. To fill in, we bought large grassy bales from our neighbors. That is how we came to have The Pile. The Pile is left after a herd of horses gets done eating, sleeping and generally living in a 1200-pound hay bale. There are many products on the market to cut this waste but they are all either too expensive for temporary use or seem dangerous for horses. Once the snow started falling and we went back to feeding small bales, I was able to forget all about The Pile. However, as our the facilities manager, Ron, could not forget. Can you see the smoke coming out of the bucket? So last weekend, he got the tractor out, lit The Pile and went to town. What a great day to burn. Lot’s of billowing white steam contrasting with the bright green John Deere. Midwinter fun at its very best! My husband (Ron) is a huge fan of The Carter Center. 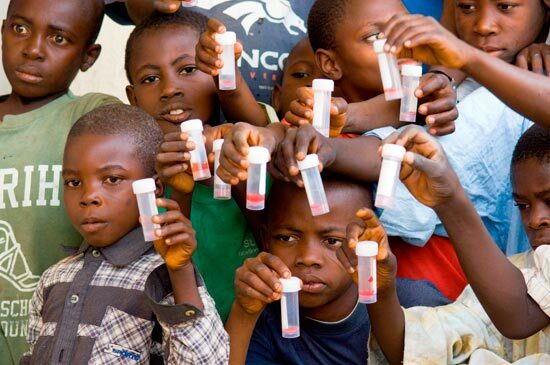 They have this ambitious program to eliminate human parasitic diseases in Africa. Reading their annual report it caught my eye that they use praziquantel to treat schistosomiasis. 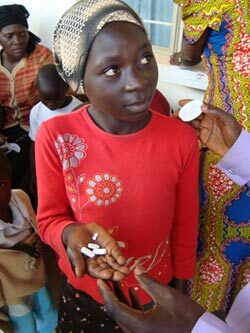 This waterborne parasitic infection commonly affects school kids, damaging their internal organs. Bloody urine is the most common symptom. These kids all show their sample in the photo below. Kids get it from swimming in polluted water. Cleaning up the water is a very long term job. In the mean time, the kids are getting an annual does of praziquantal to control the worms. Horse people know praziquantal as the active ingredient in Zimecterin Gold or EquiMax that kills tapeworm. We use it for our herd once a year after the hard frosts in December. Now I think about those kids when I’m dosing my herd. One of the things that I’ve never been able to buy into is the idea that horses get just one type of forage at a time. The corollary to this idea is that any new introductions should be done over the course of a couple days. 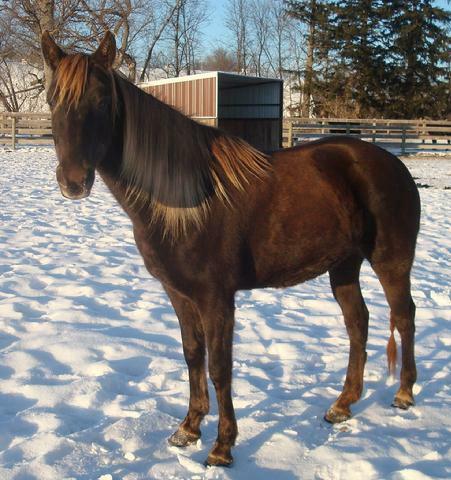 Our horses seem to feel the exact opposite, especially in the winter. I try to use a variety of hay and spread the slices widely around their paddock. (Unless the wind is really blowing. In that case, we throw it in an inside out tractor tire.) They love to snoop from one pile to the next. They especially like to wrangle over who gets whatever is deemed the better pile. Using just one type of forage makes no sense to my very amateur horse evolutionist’s mind. From what I know, Sili’s ancestors roamed some 20 miles a day eating whatever looked good. They rarely stood in the same place for 3 or 4 hours so the cougars could sniff them out and attack. On the move – a bite here, a few more there. Here’s a surprisingly artistic checkerboard of what a few days worth of hay looks like piled up and ready to go. Dark green second crop orchard grass from Paul. Our own first crop timothy and some of Gary’s brom. Both quite brown. Guess which they like best? During warmer weather our horses get plenty of time to tear around big pastures. In this icy, crusty snow season, however, they stay in the paddocks. We’ve got nice big paddocks. Candy and Samee share over ten thousand square feet and hardly ever leave the “blessed corner” anyway. That’s the corner where the cool horses get to stand. If you are a horse, you can tell right away where it is. Some uncool horses will even give up pasture time just to stand there. After a very long series of frigid, boring days in the paddock, our demur Candy (left) decided this morning that she needed to “get out of the house.” When Ron opened the gate to come in with the tractor and scrape manure, Candy just gaited her pretty little self out. Not one to mess with a mare, Ron closed the gate and got to work. When I came out of the house in my insulated Carrhart ensemble Candy looked over at me but did not stop pawing to get at the delicious dried-up, frozen brown grass the snow covers in our yard. Everything Candy does makes sense to me. I left her to her work with visions of the incredible mares who safely delivered foals on the frozen Asian Steppes of yore to make our modern breeds possible. Of course, Samee greeted me at the gate. I agreed with her case so quickly that she wasn’t quite ready to come through into the rest of the world when I opened the latch for the bright red steel gate. As soon as she was through, however, the energy just lit up her feet, flowed over her back and up through her pretty head in a perfect curve. She didn’t need to save the equine race by eating she needed to show how incredibly beautiful the world is by moving her feet!